George Dunaway, who served as sergeant major of the Army at the height of the Vietnam War, died earlier this month at the age of 85. I got to meet Dunaway through my father, whom the spit-and-polish soldier had invited to join the Special Forces Alumni Association out in Las Vegas. Dunaway also helped my father. “My father, Gerald Gitell, had served in Vietnam as a Special Forces officer and had even played a role in creating Barry Sadler’s iconic number one hit, “The Ballad of the Green Berets.” But as a loner who preferred reading to socializing, he eschewed military alumni organizations or groups of any kind. Dunaway discovered my father in a local Las Vegas coffee shop wearing a cap with a Special Forces insignia and asked him if he had served in the unit. When my father answered that he had, Dunaway invited him to a monthly meeting of the alumni group, and my father, for the first time in his life, agreed. By making the invitation, this spit and polish sergeant major helped provide a troubled veteran a place to feel at home. My father arranged for Dunaway and me to meet. I was very moved last week by my visit to the United States Naval Academy and its Memorial Hall, which commerorates fallen graduates of the school, such as Swampscott’s Jennifer Harris, whose helicopter was shot down in February. Here’s my piece in The New York Sun. 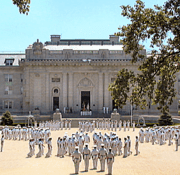 “The Brigade of Midshipmen, some 4,400 students, clad in dress blues and khakis, stands at attention, arrayed in Noon Meal Formation in front of Bancroft Hall at the United States Naval Academy. Upon command, a small group of cadet officers draw its swords. The drum and Bugle Corps strikes up the notes of John Philip Souza’s “The Thunderer.” The midshipmen, still in formation, march off Tecumseh Court. This is ritual, underlying the values and tradition of the institution that has trained officers for the Navy and the Marine Corps on the banks of the Chesapeake Bay since its inception in 1845. Even as the midshipmen lined up for inspection on Thursday, politicians in Washington were arguing about the lessons of the Vietnam War and their applicability in Iraq. I will also write a post about the magnificent new Jewish chapel on campus. It is one of the sad ironies of the Iraq War is that veterans organizations once thought to have all but outlived their usefulness are all too relevant once again. In the 1980s and into the 1990s, every small town in America had either an American Legion or VFW post on the edge of the community. With World War II veterans — the men who formed the backbone of these groups — dying off at a rate of 1000 a day, you might think these groups would be disappearing from the scene as well. But that isn’t happening. In fact, the need to support the soldiers, sailors and marines returning home from Iraq, has caused these groups to return to their original mission — helping vets adjust to life at home and making sure they get adequate health care. We tend to forget today, but there was a day when the VFW and American Legion were something other than a place to find cameraderie and an affordable cold glass of beer. The VFW was founded after the Spanish American War and the Philippine Insurrection, which are roughly analagous to the initial invasion of Iraq and subsequent insurgency. The vets came back with strange diseases, malaria and yellow fever, among others, and needed help. So too the Legion, founded in Paris in 1919 amid tales of mistreatment of returned veterans. I write about this development in my column in The New York Sun. One angle I couldn’t fully explore in my column on the funeral of Andrew Bacevich on Tuesday or my prior post involved Boston University ROTC. In 1993, I was at B.U. on graduation day; my sister was receiving her degree. My father, Gerald Gitell, a graduate of Boston University’s School of Communications, like Bacevich, and a participant in the ROTC program, disappeared for a while. When we met up with him, we learned he had paid a visit to BU’s ROTC headquarters. He came back with a document I wanted to mention in my column but couldn’t find until today. It was a list of ROTC members at BU over time. Back in my father’s class, 1963, there were 44 Boston University ROTC graduates. Five years later, during the height of Vietnam, there was one, Richard Lowery. After a spike of 8 graduates in 1969, ROTC had one graduate at best (some years, such as 1970 and 1971 had none at all). The numbers pick up again in the late 1980s and early 1990s. With the strain the military is currently under, it’s important to remember how low the stature of the Army had fallen after Vietnam — a fact reflected in these ROTC numbers. I wrote in my column that BU is not known for its military heritage, but it has more than one would think. When I attended a publicity screening of the Vietnam film We Were Soldiers, it was filled with members of BU’s program (maybe even Andy Bacevich). I stumbled into a lecture on Comm. Ave featuring journalist Joseph Galloway, who wrote of the battle the movie was based upon, sponsored by BU ROTC. In this world, you don’t necessarily know where courage is going to come from. We expect it to emanate out of Annapolis and West Point. But it’s present up and along the windy urban campus on the Charles as well. This weekend, the ANSWER Coalition is planning a new March on the Pentagon. I write about it in a short story in The New York Sun. But this year’s activities diverge from the 1960s in a key way. This year a group of veterans called, “A Gathering Eagles”, is planning a protest to support the troops and the cause for which they’re fighting. Originally billed as an effort to protect the Vietnam Memorial on the Mall, when it looked like ANSWER might hold its protest there, the demonstration is gathering steam. Thousands of participants are expected. This is interesting on a number of fronts. First, the Iraq War, like prior wars is generating its own veterans’ groups. Much as the Spanish American War created the Veterans of Foreign Wars and World War I prompted the growth of the American Legion and the Bonus Army, Iraq is making itself felt on the homefront. “Obviously there were some serious shortfalls up there. It’s obvious that they were not caring for the warriors the way they should. The ANSWER spokesman, Bill Hackwell, a combat photographer in Vietnam, added that his protest would advocate on behalf a range of causes, other than the war — including Katrina victims and immigrant rights. Less than 3400 Medals of Honor have ever been awarded. Lt. Col. Bruce Crandall (ret.) received one yesterday for his decision to keep piloting helicopters to Landing Zone X-Ray in the Battle of Ia Drang. This was one of the handful of bloodiest Vietnam battles. Crandall decided, against orders, to make 14 landings to resupply the vastly outnumbered 1400 men and evacuated 70 of the wounded. I write about Crandall and other brave helicopter pilots in my New York Sun column.